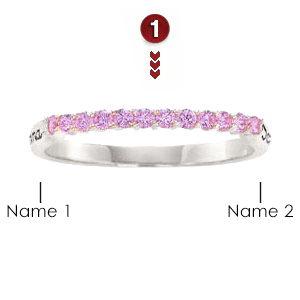 The 14kt white gold Iridescence ring is always set with 12 round simulated gemstones of the same color, each 1.7mm. Engraving areas 1 and 2 accommodate up to 12 characters, including spaces and punctuation. Import. Ring measures approximately 1.6mm at top width, 2.25mm at palm width.